Great excitement in Venice to valorise the economic potential inherent in pleasure boats. The Distretto per la cantieristica nautica (Boatyard district) has been set up, a large Consortium for superyacht assistance has been created, the VYSA, Venice Yacht and Ships Assistance.All in all, despite resistance by Mr. Paolo Costa who holds the positions of the Commissario alle Acque (Public Official in charge of water matters) and also of Lord Mayor of Venice, something is finally starting to move. The need for similar initiatives for pleasure sailing has seemed obvious recently to those who live in Venice and who notice such things, with the addition to the "sky-line of Riva degli Schiavoni and Punta della Salute. This view in fact has been somewhat modified by the presence of a large quantity of super yachts, which enter from the mouths of the Lido, moor at the canal sides for a while and then leave. These are splendid sailing and motor-yachts that have never before crowded the banks as they do now mainly during the long, hazy Venetian summer. 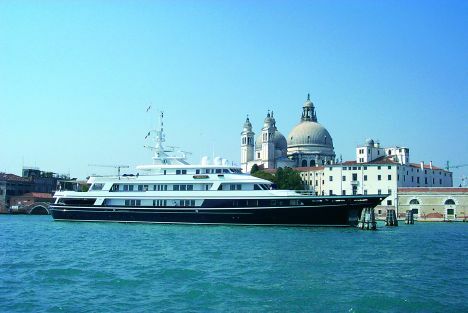 We went to the Venice maritime station to interview Edward Pegan, director of the JLT Yacht Agency (S. Marta - Punto Franco - Fabbricato 17; 30123 Venezia; e-mail: jlt@vegaservice.net). 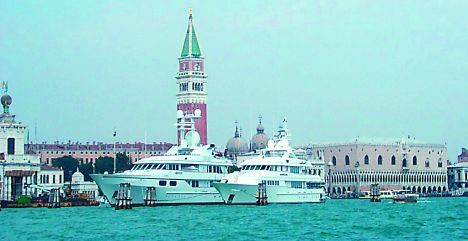 Mr. Pegan, can you confirm our impression regarding this increase in super yachts in Venice? Certainly. Since I came to work in Venice, about four years ago, we have gone from 20 to 200 units forecast for 2004. This is an incredible explosion that has brought lots of work and satisfaction to all involved. Our task, together with all the people and companies that collaborate with us, is to organise and manage this valuable traffic. How do you explain this growth? There are various reasons. At the base there is without doubt the market tendency for super yachts to look for new destinations and new marinas. Venice is one of the relatively distant marinas to reach under normal conditions and there are no outstanding ports of call on the Italian side as you sail up the Adriatic. Once this represented a deterrent for choosing Venice. However the opening of Croatian resorts and the uncertain incidents in the Middle East have acted as a catalyst that has made Venice become the perfect centre for super yachts, alongside other world-famous destinations like Florida, the Caribbean, Monaco, Antibes, Sardinia, Capri, Greece etc. Moreover, the increasingly greater number of luxury boats, in proportion to the marinas able to accommodate them, has meant a necessary tendency to look for new water spaces and berths. Venice's beauty has remained unchanged but some important things have changed in the world, so now we have this new reality to manage in the best way possible, a reality that we ourselves have actively contributed to promoting and launching. What does Venice currently have to offer as an attraction for super yachts? For our on board clients, whether charter or private owners, we have excellent restaurants, wonderful churches and buildings, where they can organise events, original and fun shopping trips for glass on Murano and lace on Burano, some world famous textile manufacturers like Bevilacqua and Fortuny who alone are worth a visit for foreigners, as well as the opportunity of Italian high fashion shopping. Furthermore, events of an unequalled cultural wealth and of enormous emotional impact: the Redeemer's feast day with its fireworks, the film festival and above all the Contemporary Art Biennial. With regard to the latter, we had surprising impetus for participation in the Biennial; just think that during the last edition we had no less than 15 boats at the same time, here specifically for the event and we already have many bookings for 2005. These people are sponsors and are very involved in the Contemporary Art market. Venice's other strong point is its airport: modern and efficient, it offers a vast range of international links and for this reason too Venice is chosen as a departure point for super yachts cruising to Croatia. For those who want to reach the boat in Croatia, in fact, the only airports of a certain size are Venice, Spalato and Dubrovnik, while private jets can use airports situated every 200 km along the Croatian coast, an inheritance from the war. Cruises have turn-around periods (the interval between disembarkation of one group of guests and embarkation of the next group) in Venice, a period of 1 to 3 days when the boat is supplied with everything necessary: food, spare parts, technical service and also strange things such as edible flowers for refined dishes. At this point I have to ask: what are the strangest requests you have had to satisfy? I can even give you some examples: a taxi ride to Bologna (about 150 km. from here) to buy a special Japanese mattress (futon) for an owner who would only sleep on this kind of bed; organisation of a pedicure for two pedigree dogs; an authorisation request for a helicopter to land in Piazza San Marco (denied obviously); getting a gondola for the sole purpose of transporting luggage from the airport to the yacht (about 6 km. ), etc. What other operations are carried out in Venice? When a yacht is in Venice for its turn-around period there are various activities that must be carried out in a very short time. In particular I refer to repairs and maintenance of the boat from a technical/mechanical, electrical/electronic point of view, as well as work on the interiors. The first kind of work basically includes checking the navigation systems, radar, satellite, electronic systems, air conditioning, refrigeration and everything else that permits perfect working and the general good state of the boat. For the second, I mean laundry services, dry cleaning of carpets and upholstery, cleaning and looking after accessories and so on. As I mentioned earlier, provisions and spare parts are always supplied and a fundamentally important thing for yachts in Venice is the chance to fill up with "duty-free"fuel. What services do you provide for owners and guests on board? A complete personalised range: from photos to watercolour reproduction of the boats, to the best guides in Venice with exclusive excursions and tours; from concerts on board, even in fancy dress, to limousine services, right down to beauty treatments. When the boats arrive in Venice we also offer a parcel of welcome gifts, containing high quality typical Venetian products. What could Venice offer to further attract and satisfy the super yacht market? The city could, in my opinion, organise parties and events with close correlation between the city itself and the water that surrounds it and gives it life. Cannes comes to mind, where during the film festival there are hundreds of moments for encounter between festival and yachting; spectacular synergy. Furthermore we need space, space and more space, quays organised with the possibility of water, electricity, telephone and IT cable facilities. Seeing that there isn't yet a marina in Venice, what differences does coming to a lagoon rather than going to Monaco make to a super yacht, what are the difficulties? There are obviously positive and negative aspects. One of the positive sides is that the yachts, moored along the canal sides or at the "briccole" (mooring posts) of Punta della Salute, become an integral part of the city itself and of its panorama. While a negative factor is that, without an specific space organised as potential marina, requests for mooring exceed the space we currently have at our disposal. As I mentioned above, being unable to use the basic services normally offered in a marina makes a yacht's visit to Venice a bit more complicated. Mr. Pegan, you live in Venice but you continually travel to and from the various world super yacht centres: what can your experience tell us about the future of this activity in Venice and in the rest of the world? It can be said that over the past decade the mega-yacht sector has increased considerably, despite the recent shadow of recession having affected many countries. Some towns or cities have turned the situation to their advantage and have managed to benefit from its growth and expansion. Some island economies, for example have grown thanks to the relative ancillary business (workshops and repair laboratories, charter and sales offices, suppliers of local products and services, tourism, new jobs and so on). Venice with its beauty and wealth of sailing and maritime knowledge, let alone its geographic position, has the potential to become a world yachting centre.